I'm always in favor of extending a manicure when I love the polish as much as I love Raven. So I added Zoya Chloe. Zoya Chloe over Zoya Raven. 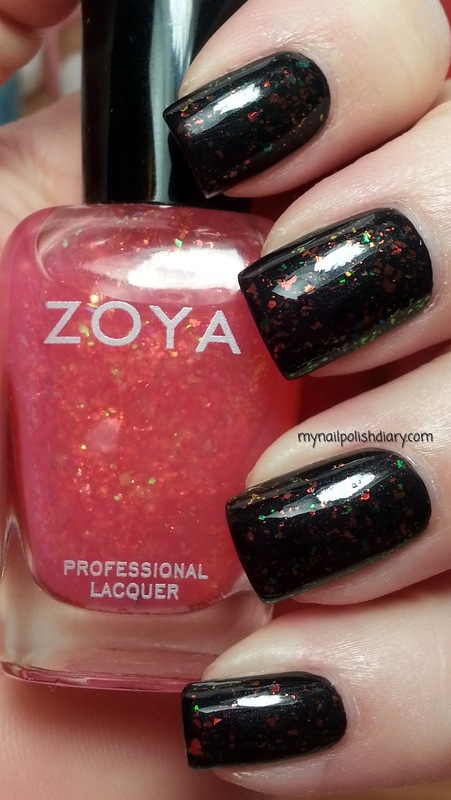 Chloe was released spring 2012 in Zoya's Fleck Effect Mylar Topcoats Collection. This is so stunning. The pictures look good, but in real life it's so gorgeous. The flakies in Chloe show orange, pink, green and a tiny bit of yellow. It's like a rainbow on your finger tips. Love flakies! It's gorgeous for sure! Thanks for looking Liesl!! Oh I have to try this when I get to go home to my stash again - I am stuck post cancer surgery and now more treatment and dealing with a post op infection from #E#LL that won't go away. I have both of these - they look lovely together.